Whales in Patagonia Peninsula de Valdes, the natural reservoir of marine fauna. Train to the Clouds, Salta: 434 Km of Andes Mountains at 4220 meters above sea level. Jujuy, Quebrada and Puna. Remains of old cultures that last among valleys of colorful hills. A monumental ice-wall of 70 meters of height that falls majestically. treasures in a geography of a different time. Tango-A Night of Passion. A night visit to a series of Milongas of Buenos Aires. Adventure in Bariloche Mountains, lakes, rivers, forests and falls are the scenery for the action. The roar of the waters in the heart of the Forest. The Lighthouse at the End of the World Inspiration to Jules Verne, Ushuaia the most southern city in the world. 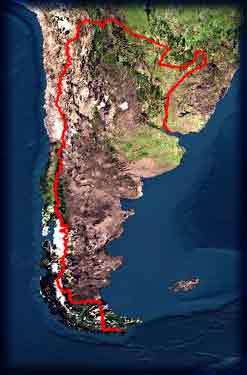 argentina The Pampa of the Gaucho. Noble people with traditions and customs in the vast and fertile Pampas. Jesuitical Cordoba and folk tradition Cities and Journeys. Fossils of 'biggest' dinosaur found in Argentina. Unesco listed Talampaya National Park, Ischigualasto, and the Jesuitical Estancias in Córdoba. All the trails - Prices - Competitions - Events. Otilia Kusmin proposes original vernacular delicacies. Rafting under a full moon in the Mendoza River. Route technically simple with wonderful views. The top ten Argentina's wine brands. Providing essential data, expert information and those secrets that only an Argentinean would know. In this way you will be able to organize your trip with a minimum of risks and a maximum of pleasure. ArgentinaXplora is the result of the work of a team of many disciplines. We intend to build a large door that opens to Argentina, that promotes the growth of tourism in our country and brings efficient service to the world traveler. Instantly, with precise information , free and of easy access. The first calf born in Argentina obtained by cloning of a fetal cell.